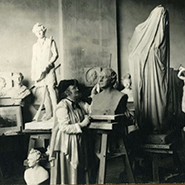 In 1892, European portrait sculptress Elisabet Ney (1833-1907) purchased property in Austin, established a studio named Formosa and resumed her career as a noted sculptor of notables. At Formosa, Ney sculpted legendary Texans, among them Stephen F. Austin and Sam Houston. Ney also assembled at her American studio portraits of European notables, including King Ludwig II of Bavaria, Otto von Bismarck, Arthur Schopenhauer and Jacob Grimm rendered from life as a young artist in Europe. At the turn of the 19th century, Elisabet Ney’s studio became a gathering place for influential Texans drawn to “Miss Ney” and to the stimulating discussions of politics, art and philosophy that took place there. Following Ney’s death in 1907, her friends preserved the studio and its contents as the Elisabet Ney Museum and established the Texas Fine Arts Association dedicated to her memory. The Elisabet Ney Museum is listed on the National Register of Historic Places based on its significance as the former American studio of Elisabet Ney. The museum is also a member of the National Trust for Historic Preservation's Historic Artists’ Homes and Studios program. Unless otherwise indicated, the portraits and personal memorabilia in the Elisabet Ney Museum form the Elisabet Ney Collection of the Harry Ransom Humanities Research Center of the University of Texas at Austin. An unusual stylistic amalgam of limestone architecture, the building was completed in two phases. The first phase resulted in the Neo-Classical main studio and reception room, built in 1892. The second phase, completed in 1902, offered a copious basement, addition studio space, a handsome parlor, and a tower, in which her husband Edmund would write. Elisabet spent most nights on the roof; doors in floors, cielings and walls, into and out of the building abound. Situated on 2.5 acres in Austin’s National Register Historic Neighborhood of Hyde Park, approximately half of the site is planted as a recreation of the prairie biome that existed on the site when she arrived here. Extensive work was undertaken to make the landscape as original as possible, with invasive species replaced by natives as thoroughly as possible. This includes grasses, trees, and wildflowers. Much of the year it is a gold mine for pollinators, as many of the plants that are here are rarely found off-site, especially within the city limits. Over the last few years, the museum has embarked on a vigorous programming schedule, engaging in events as varied as Polka festivals and "speed Philosophy". 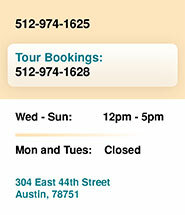 For more information on booking a group tour, please contact staff at 512-974-1625.